Amazing way to organize everything in my garage! Will be buying another one in the future to maximize all the space. All the hooks really help in organizing all the miscellaneous items around the garage. Organize your sport gear and keep it all in one place with this Flow Wall deluxe sports storage set. With plenty of space to fit skateboards, helmets, hiking and skiing gear, multiple bikes and more, this storage set is ideal for organizing your entire family's sports gear. This strong 24-square foot panel can hold up to 2400 pounds of equipment, or 100 pounds per square foot. 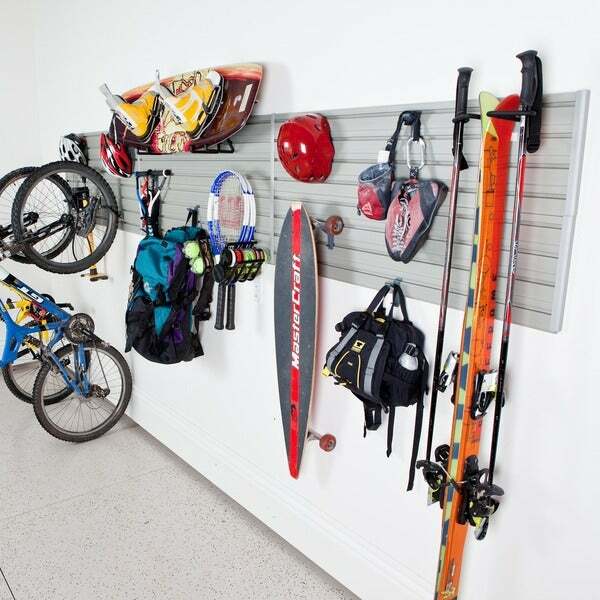 Including a total of 10 multi-use X-hooks and seven specialty use hooks that fit anywhere on the panel, this set organizes your gear any way you want to maximize your storage space. Each panel holds up to 100 lbs. per sq. ft.
X-Hooks hold up to 15 lbs. Ski Sports Hook holds up to 25 lbs. Vertical Bike Hook holds up to 35 lbs. Racquet Sports Hook holds up to 20 lbs. I have no background in organizing garage and I believe this is the best storage set to start. I got it via UPS and got it as how I expect it to be. I got the silver slats and the storage hooks that I need. I certainly would recommend this to a friend. I have 2 bikes and miscellaneous sports items with this. I also purchased the garage system. so between the 2 sets I was able to wrap around the walls of my garage. They were easy to install. Love this storage set; lightweight, but sturdy. Went up well (although I received assistance). Everything is organized and off the floor. Works pretty well and easy to install. Takes a little trial and error with how to use most efficiently and you need to buy A LOT of hanging accessories to make it useful. Took about an hour to install but very simple. You'll need two peoole, a level and an electric drill. "It appears that this has six 4 ft x1 ft wall panels. In the picture shown it appears that they are installed in two rows of three panels (dimensions of 12 ft wide x 2 ft high). Is it possible to install them instead in three rows of two panels (dimensions of 8 ft wide x 3 ft high)?" The panels are 4 feet x 1 foot, they can be installed in any configuration. So yes 3 x 2 would work. Wife says I need to organize the garage. "Can the 12 inch wall panels be connected vertically rather than horizontally?" Hello SonnybrookMan, thank you for your inquiry. Unfortunately, the information you have requested is currently unavailable. You will receive an email notification once an answer is posted. Have a great day. "What are the dimensions of the wall panels?" Hello happyshopper4life, each panel is 4 feet by 12 inches. Have a great day!